On Thursday’s episode of “Jeopardy!,” host Alex Trebek showed contestants a prominent photo of Jack White and gave a clue about him building a record pressing plant, yet one contestant still confused him with Eminem. Trebek said the clue, “A recent vinyl resurgence has been aided by this musician, who built a pressing plant in his Detroit hometown.” The photo featured White donning a goatee and pencil thin mustache. Contestant Julie buzzed in guessing “Who is Eminem?” before another contestant said the right answer. 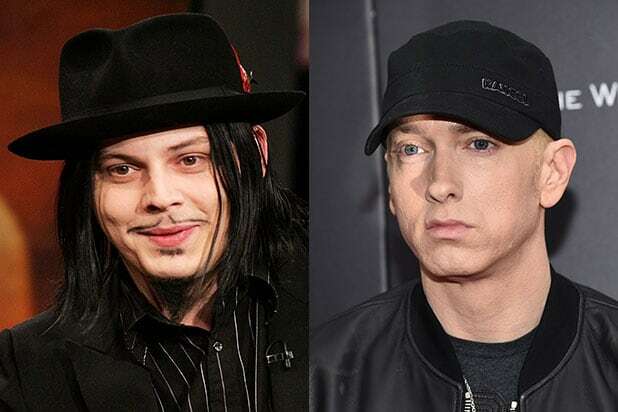 White just released two new songs from his upcoming third solo studio album “Boarding House Reach.” Eminem released his latest album, “Revival,” in December. Last February, Third Man Records, which White founded in 2001, opened a state-of-the-art vinyl production facility in Detroit. It’s the first label to operate a fleet of brand new, environmentally efficient pressing machinery and minimizes water waste by using recycled water in the air conditioning system — therefore being the only fully climate-controlled pressing plant work environment in the world.